It will come as no surprise that there has always been a devotion to the Pierced Heart of Jesus. The Holy Scriptures both reflect a devotion present in the Church from the first outpouring of the Holy Spirit and inspire the same devotion in those who reflect upon the Word of God with faith. It is especially in the application of the Word of God to the daily life of Christians that Church teaching has encouraged devotion to the Sacred Heart of Jesus. “But if men have always been deeply moved by the Pierced Heart of the Savior to a worship of that infinite love with which He embraces mankind … it must yet be admitted that it was only by a very gradual advance that the honors of a special devotion were offered to that Heart as depicting the love, human and divine, which exists in the Incarnate Word” (Pope Pius XII, Encyclical LetterHaurietas Aquas, May 25, 1956, nn. 90 and 93). The devotion to the Sacred Heart of Jesus was bound to grow and develop down the Christian centuries, especially in times when our love of God has grown cold or we have become indifferent to the love of God. At those times, God our Father draws us to the Heart of His Son, the image of His immeasurable love for us, so that we may be inspired and strengthened to love Him in return. The great teachers of the Faith, from the beginning days of the Church, always spoke of the birth of the Church from the wounded side of Christ. Their teaching was truly theological and, therefore, spiritual. It invited the faithful to draw from the Pierced Heart of Jesus the grace of salvation, especially through the Sacraments and, above all, through the Holy Eucharist. Often the birth of Eve from the side of the sleeping Adam was presented as the foreshadowing of the birth of the Church from the wounded side of Christ asleep in death. “The second Adam with bowed head slept on the cross, in order that a spouse might be formed for Him from that which flowed from His side as He slept. Death, by which the dead come to life again! What could be more cleansing than His blood? What more healing than this wound?” (Treatise on John, IX, 10). The early Fathers of the Church taught that, in the Heart of Jesus, the Christian finds the source of his or her life in Christ. Even as the Church herself came to birth from the wounded side of Christ, so does each Christian come to life spiritually from His glorious Pierced Heart which ever pours out the sevenfold gift of the Holy Spirit upon us. “Blood and water at once flowed out of the wound. It is not by mere chance or unwittingly that these two fountains sprang up at this juncture. It is because blood and water are two constitutive elements of the Church. Those already admitted to the sacred rites know this well; those, I mean, who have been regenerated in the waters of Baptism and who in the Eucharist feed on Christ’s flesh and blood. It is to this one source that all the Christian mysteries trace back their origin. And so when you apply your lips to this awesome cup, do it as though you drank that precious Blood from the open side of Christ Himself” (Homily on John, 85). In his characteristically strong language, Saint John Chrysostom reminds us of the unity of our participation in the Holy Mass and the Sacrifice of Calvary. The wounded side of Christ, His Most Sacred Heart, is a constant reminder to us of His living presence in our midst, in the hearts of those who love Him, who place their hearts in His Sacred Heart. A noticeable development of the devotion to the Sacred Heart of Jesus took place during the Middle Ages. Saint Bernard of Clairvaux (1070-1153), writing about the love of Christ, reminds us that, through prayer, our hearts are made one with the Heart of Christ. Saint Bernard inspired many other theologians and spiritual writers to reflect lovingly upon the Heart of Christ as the source of our love of God and of one another. “Let us live so, Heart to heart, Wounded, Jesus, as Thou art. If through my heart Thou wilt but strike With shame’s arrow, sharp and dire. Put my heart within Thine own, Hold me, leave me not alone. Here my heart shall live and die, To Thee ever drawing nigh; Strongly would it thirst for Thee, Jesus, say not no to me, That it may rest in Thee content” (Quoted in the reprinted edition ofHeart of the Redeemer (San Francisco: Ignatius Press, 1992), pp. 96-97). The hymn illustrates, in a striking way, the intimate love of God and of others, which has always been inspired by the devotion to the Sacred Heart of Jesus. The Friars of the Order of Preachers, or Dominicans, and of the Order of the Friars Minor, or Franciscans, helped very much to bring the devotion to the Sacred Heart of Jesus to all the faithful to whom the Friars preached and ministered. Saint Francis of Assisi, founder of the Order of Friars Minor, meditated so deeply upon the deep internal suffering of the Heart of Christ that God granted to him the favor of bearing in his own body the sign of the wounds of Christ, the stigmata, especially His pierced side. Saint Bonaventure, spiritual son of Saint Francis of Assisi and great theologian of the 13th century, gave rich expression to what he had learned from Saint Francis about the devotion to the Sacred Heart of Jesus. 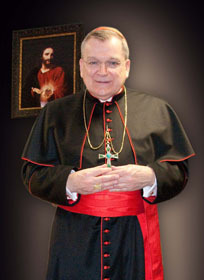 He has left to us inspiring theological reflections on the union of our hearts with the Sacred Heart of Jesus. In one of his writings, he exclaimed: “Oh, what a blessed lot is mine to have one heart with Jesus!” (Quoted in Heart of the Redeemer, p. 101). “God’s love is seated within the Savior’s Heart as on a royal throne. He beholds through the cleft of His pierced side all the hearts of the children of men. His Heart is King of Hearts, and He keeps His eyes fixed on our hearts. Just as those who peer through a lattice see clearly while they themselves are only half seen, so too the divine love within that Heart, or rather that Heart of divine love, always sees our hearts and looks on them with His eyes of love, while we do not see Him, but half see Him. If we could see Him as He is, O God, since we are mortal men we would die for love of Him, just as when He was in mortal flesh He died for us, and just as He would still die for us were He not now immortal” (Quoted in Heart of the Redeemer, p.118). Saint Francis de Sales helps us very much to know how to live always in the presence of Christ whose Pierced Heart ever lies open for love of us. Saint Francis de Sales influenced greatly Saint Jane Frances de Chantal, foundress of the Sisters of the Visitation of the Blessed Virgin Mary, who have a monastery and school in the Saint Louis Archdiocese, in which the devotion to the Sacred Heart of Jesus is very much fostered. Saint John Eudes helped to develop the liturgical aspect of the devotion to the Sacred Heart of Jesus and the Immaculate Heart of Mary, under which God the Son took a human heart. Reflecting upon the union of the Heart of Mary with the Sacred Heart of Jesus, Saint John Eudes referred to the Sacred Hearts of Jesus and Mary. He also founded a religious order of men and of women, under the title of the Sacred Hearts of Jesus and Mary. Many communities of men and women religious have been founded under the inspiration of the Sacred Heart of Jesus. In the Archdiocese of Saint Louis, for example, Sisters of the Apostles of the Sacred Heart of Jesus and of the Society of the Sacred Heart and Carmelite Sisters of the Divine Heart of Jesus. The Jesuit Fathers and Brothers also have a strong devotion to the Sacred Heart. Saint Margaret Mary Alacoque, a member of the Sisters of the Visitation of the Blessed Virgin Mary, was deeply imbued with the devotion to the Sacred Heart of Jesus. Saint Francis of Assisi influenced her very much in her devotion. At the Visitation Convent in Paray-le-Monial, Christ appeared and revealed His Sacred Heart. The apparitions took place between December 27, 1673, and the Octave of the Solemnity of Corpus Christi in 1675. They are all connected with prayer before the Blessed Sacrament. There were four apparitions, the last of which is the greatest. The apparitions reported by Saint Margaret Mary are a matter of private revelation. No one is held to believe in them. They have enjoyed the highest approbation of the Church. The apparitions to Saint Margaret Mary were not given to her for her personal consolation but for a mission which Our Lord confided to her, namely the spread of the devotion to His Sacred Heart. From the first apparition, Our Lord made it clear to Saint Margaret Mary that His Heart is burning with love of mankind and that He desired her to be the Apostle of His Divine Love, His Sacred Heart. “I give you now the title of the beloved disciple of My Sacred Heart” (Louis Verheylezoon, SJ,Devotion to the Sacred Heart (Westminster, Maryland: The Newman Press, 1955), p. xxiv). “Behold this Heart which has so loved men that It spared nothing, even going so far as to exhaust and consume Itself, to prove to them Its love. And in return I receive from the greater part of men nothing but ingratitude, by the contempt, irreverence, sacrileges and coldness with which they treat Me in this Sacrament of Love. But what is still more painful to Me is that even souls consecrated to Me are acting in this way” (Devotion to the Sacred Heart, p. xxvii). Our Lord then asks that reparation be made and love be inflamed through the consecration of hearts to His Sacred Heart. Specifically He asked for the observance of the First Friday Holy Mass and Holy Communion of Reparation, the Holy Hour on the Thursday night before First Friday (recalling the Agony in the Garden), and the solemn feast in honor of the Sacred Heart. It was during the great apparition that Christ revealed the image of His Sacred Heart that is depicted in statues, paintings and icons: His Pierced Heart on fire with love, crowned with the Cross and enfolded with the Crown of Thorns. Christ holds His Heart to show us how much He loves us. The image which He revealed to Saint Margaret Mary is understood through the words which He spoke and which I have just quoted. “Today everything which concerns the Sacred Heart of Jesus has become familiar and doubly dear to me. My life seems destined to be spent in the light irradiating from the tabernacle, and it is to the Heart of Jesus that I must look for a solution of all my troubles. I feel as if I would be ready to shed my blood for the cause of the Sacred Heart. My fondest wish is to be able to do something for that precious object of my love” (Journal of a Soul (New York: McGraw-Hill, 1964), pp. 148-149). The devotion to the Sacred Heart of Jesus was the center of his spiritual life. When visiting the death cell of Saint Maximilian Kolbe at the concentration camp of Auschwitz, in September of 2003, I was shown another death cell around the corner from that of Saint Maximilian. The guide told the story of a doctor who died in it. After his death, the guards discovered that he had etched an image in the plaster of the wall with his finger nails. When his family was asked what the image could be, they recognized it immediately as the figure of the Sacred Heart of Jesus, which was enthroned in their family home. Placed in the cell to die, the doctor made a wonderful act of hope in the immeasurable love of God. Papal teaching, especially from Pope Leo XIII to our present Holy Father, holds up the devotion to the Sacred Heart of Jesus as a privileged form of devotional life for all of the faithful. Quoting Pope Leo XIII, Pope Pius XII declared devotion to the Sacred of Jesus “the most effective school of the love of God; the love of God, we say, which must be the foundation on which to build the Kingdom of God in the hearts of individuals, families, and nations” (Encyclical Letter Haurietas Aquas, n. 123). I hope that my reflections will help you to prepare your heart and home for the Enthronement of the Sacred Heart of Jesus. May the Immaculate Heart of Mary intercede for us, that many hearts and homes will be consecrated, with her Heart, to the Sacred Heart of Jesus. Sacred Heart of Jesus, of Whose fullness we have all received, have mercy on us.